The moment I set my eyes on Ria's post,I knew I was going to try it out too.Though not a big fan of the original Medhu Vada or Uzhunnu vada,I am a big sucker when it comes to the adorned vadas-in curd,sambhar or even rasam.Amma used to make these crispy vadas when we were young as an after school snack,but I developed a taste for it only much later. Surprisingly,I have not tried to make it myself even once.I always thought it was a tedious process.Well,any recipe which calls for steps a bit complicated makes me averse to it.In this case,the careful grinding of Urad dal-not too thin,not too thick.To top it,I wasn't sure if I would be able to make them into the famous doughnut shapes. But Dahi vada is a totally different recipe altogether.No need to make the vada look pretty since you are anyway going to dunk them in curd.Ever since I came across this method to shallow fry vadas,I've been planning to make this.Though I am of strong opinion that food must look as well as taste good,I let go of the not-so-vada-looking looks because the taste was not one bit compromised.Perfect for those snack cravings and the star ingredient-Dates and Tamarind chutney takes the Dahi vada to a totally different level!! Grind it to a thick smooth paste along with 1/2 cup of water and salt.Add curry leaves,green chillies and whole peppercorns and pulse again. The batter should be on the thicker side,you should be able to scoop it out. Add the rice flour/semolina to achieve that consistency. Deep fry the vadas in hot oil OR use a Unniyapam pan/Aebleskiver pan. Pour 1/4 tsp oil in each depression and pour a tbsp of Urad dal batter into each. Close with a lid and let it cook for about 2-3 minutes. Flip over and cook the other side for another 3-4 minutes. Soak them in water +salt (add only if you need more salt for the vadas) for 2-3 mins and squeeze out the excess water.I kept a bowl of warm water and dipped each vadas on both sides and squeezed them out immediately. If your yogurt is thick, add water to a thick but pourable consistency. Add sugar and salt to taste.Keep aside. Drizzle few tablespoonful of homemade tamarind chutney over it. 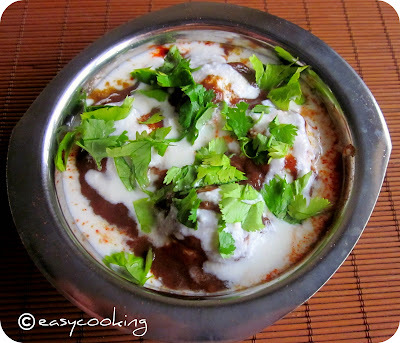 lovely delicious and mouth watering dahi vada. Woww lipsmacking dahi vada, makes me drool..
OMG Divya, this looks AMAZING! Your photos had me salivating!!!! Lovely clicks and I have made them in the little appam pan too but in my opinion, the deep frying gives it a free texture that cant be compared...Neways your looks so spongy adn aawesome and with the sweet tamarind chutney and the cilantro youve got me hooked lady!!! I was heaving that sigh of relief when I read abt your lazy on and off blogging moods and veg rice post. Here I see updations once in two days!! ;) :D :)...wish i got that spirit too..
Had been eyeing ria's vadas and divya, yours are delectable ones!! !good idea of making them in uniappa chatti!!! I always flaw miserably with vadas esp the shape and the texture. 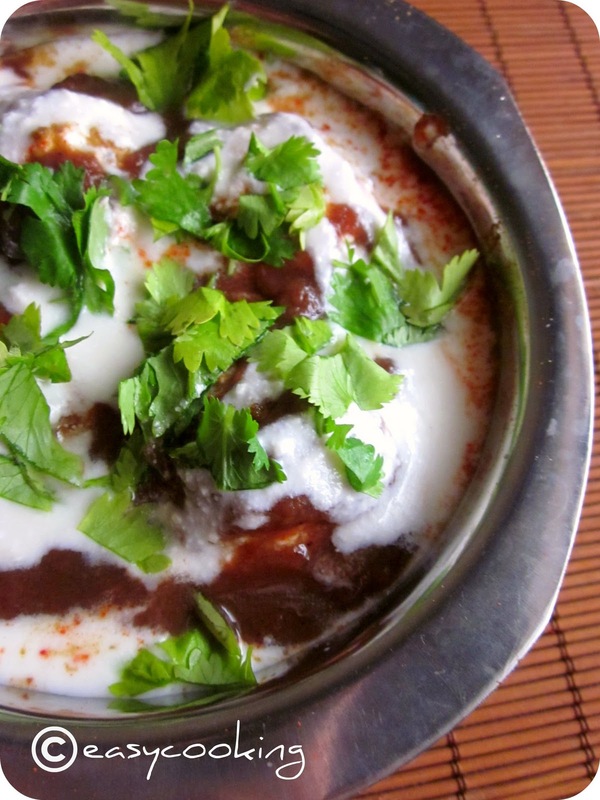 I just finished my lunch yet these clicks are making me hungry.Dahi vadas are my all time favorites.Looks yumm and the shallow frying makes it all the more healthy..
Yummy wadas! I tried with the appam pan before and it tasted like appams..haha (uditha appo).. so started to fry them. BTW, did you know that if you fry at the right temperature the food absorbs less oil than with pan frying (or appa chatti)? I'm not sure if it is the same as flash frying, but it is very true..but the temperature has to be right, else it becomes oily. So much for frying!